Royal Mail have announced their intention to close our local sorting office meaning residents would have to travel to Penge. There is no direct public transport there and elderly residents and those with mobility issues will be detrimentally affected in West Norwood. We have spoken with our local MP Helen Hayes who has been incredibly responsive. We will join her in March to meet with Royal Mail managers and with the postal Union CWU to discuss. Please get in touch if the closure will affect you, your business or your neighbours. We’re really delighted that the new Over-60s Club on Peabody Hill was awarded £200 from Age UK Lambeth to hold an event this winter helping older residents stay happy and healthy during the cold weather. Michael and Margaret, Peabody Hill residents, started the club when they were doorknocking on the estate with a petition about a bus service. They met many older residents who rarely got out because of the steep hill, social isolation and poor health. They decided that they would do something about this – we supported them to book the community hall once a week and organise a coffee afternoon. They delivered invitations across the estate and on the day they drive round to pick up any residents with mobility issues in their car. It has been a huge success – twenty older residents regularly attend and the club are organising a coach trip to see the Christmas lights in Oxford Street and have fish and chips together in a couple of weeks. On 22nd December, the funding from Age UK will be used to have a Christmas party. There will be hot food, fun activities and decorations. Speakers and special guests will be invited to share tips on keeping energy bills low, staying warm and active, and where to find advice, and Helen Hayes MP will be there to officially start the party! 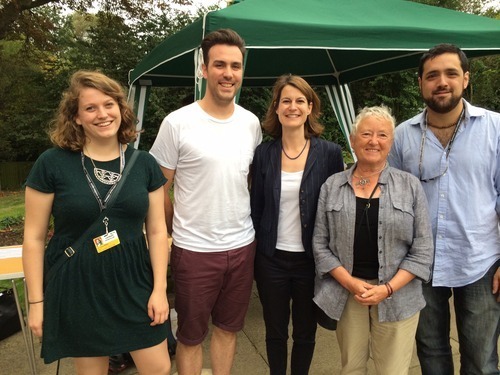 Max, Anna & Fred were joined by former Thurlow Park Cllr Ann Kingsbury, and Dulwich & West Norwood parliamentary candidate Helen Hayes as we all enjoyed the All Saints Church autumn fair. It was lovely to see all the various stalls and talk with local residents about what was happening in their area.